A REAL MOM: EMOTIONAL, YET THE ROCK. TIRED, BUT KEEPS GOING. - ProudMummy.com the Web's Community for Mums. 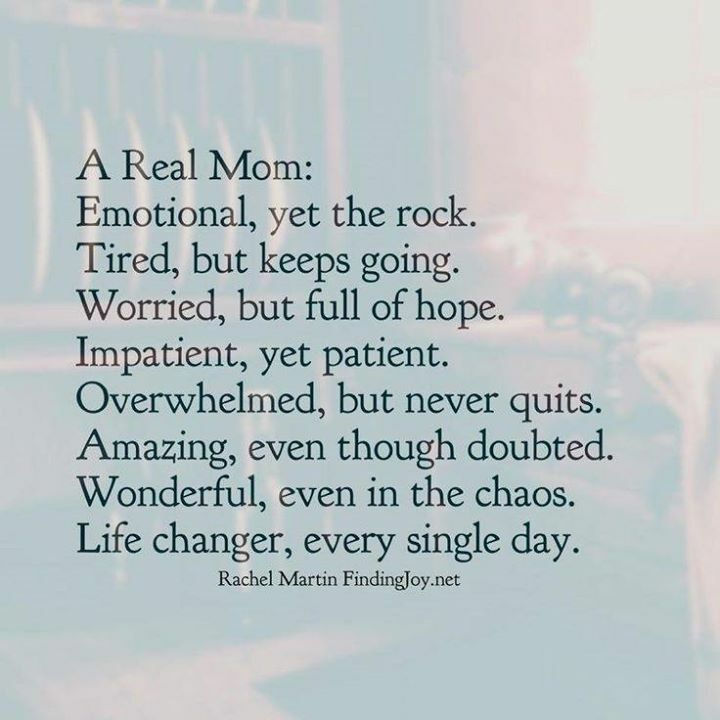 Home » Memes » Parenting » A REAL MOM: EMOTIONAL, YET THE ROCK. TIRED, BUT KEEPS GOING. A REAL MOM: EMOTIONAL, YET THE ROCK. TIRED, BUT KEEPS GOING. A REAL MOM: EMOTIONAL, YET THE ROCK. TIRED, BUT KEEPS GOING. WORRIED, BUT FULL OF HOPE. IMPATIENT, YET PATIENT. OVERWHELMED, BUT NEVER QUITS. AMAZING, EVEN THOUGH DOUBTED. WONDERFUL, EVEN IN THE CHAOS. LIFE CHANGER, EVERY SINGLE DAY.